Powers/Abilities: Although a normal human being, Chuck Blayne was athletically and academically gifted. While operating as a Communist agent, Blayne was knowledgeable in the use of explosives. When caught in a life-and-death situation, the cowardly Blayne psychologically broke from the stress and apparently suffered a nervous breakdown. (Captain America Comics#78/4 (fb) - BTS) - Although the past of Chuck Blayne is largely unrevealed (see comments), his reputation won him much acclaim, and he had a following of boys across the country who hero-worshiped him; but at some point, Blayne also began to secretly operate as a Communist spy. (Captain America Comics#78/4) - Blayne made a television appearance where he addressed his devoted fans and delivered an impassioned and inspiring speech--Blayne told the boys of America that the future belonged to them; he advised them to keep their minds and bodies strong, and to always play to win. Blayne's televised speech was seen by "Steve Rogers" and Bucky; after watching the broadcast, Bucky admiringly commented that the boys of the nation would do anything for Blayne, while "Steve" merely commented: "Hmmmm! Reminds me of someone..."
Later that same day, Blayne made a secret rendezvous at the office of his spy leader, who dispatched Blayne on a mission of destruction. (Captain America Comics#78/4 - BTS) - Blayne secretly planted two time-bombs in the main gallery of the United Nations Building--one in a ventilator shaft, and the other in the gallery's large wall clock. 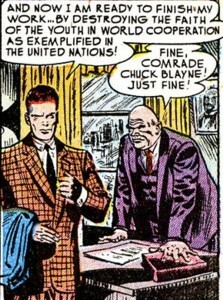 (Captain America Comics#78/4) - The next day at 2 o'clock, Blayne made an appearance at the UN. 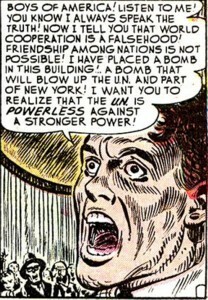 Before television cameras, he immediately launched into a fiery tirade of anti-United Nations rhetoric--Blayne was attempting to sway the youth of the nation to his assertion that the organization was powerless and the idea of world brotherhood was a farce; to support his claim, Blayne announced that he had planted a bomb which would destroy the UN Building and part of New York in one hour. In the ensuing panic, Blayne was handcuffed and taken into custody by the police. 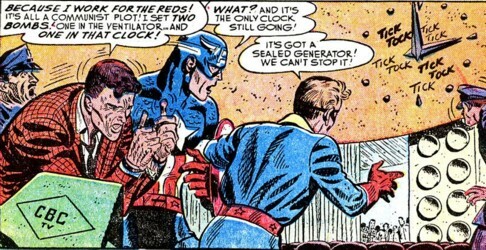 Captain America and Bucky rushed into the UN to help; after forty-five tense minutes of searching, Cap located the first bomb in the ventilator shaft, and the infernal device was disarmed. Cap told the police to remain quiet about his finding the bomb; then, to keep the boys of America from believing Blayne was a hero, Cap forced Blayne back into the gallery to get him to confess his true motives. In front of a live television camera, Captain America told Blayne that there were only four minutes left before the detonation; unaware that the first bomb was deactivated, the steadfast Blayne said he wasn't afraid to die for his cause, and Cap continued with the countdown. At one minute 'til 3 o'clock, the terrified Blayne finally broke down--he confessed he was a Red spy, and that he had planted two bombs, with the second still active in the wall clock! With only thirty seconds to spare, Captain America bravely leaped up on the clock's hour-hand and immobilized the minute-hand, keeping it from reaching the hour of doom until Bucky finally announced that the bomb had been disarmed. After the crisis was averted, Bucky saw the treacherous Chuck Blayne sobbing, and a police officer mentioned that the blubbering coward had "cracked up completely". Bucky asked Cap who that someone was that he said Blayne had reminded him of earlier; Cap replied that Blayne's inflamed oratory was reminiscent of Hitler (see comments). Comments: Created by an unidentified writer and John Romita (artist). My guess is that Chuck Blayne was an award-winning college athlete. 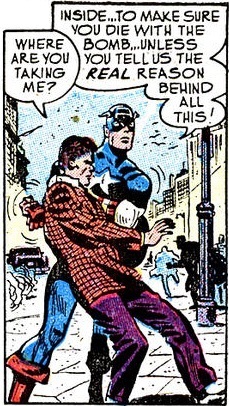 In regards to Captain America comparing Blayne to Hitler: Since the "Commie Smasher" Cap of the 1950s was only a teenager during World War II (and therefore was not known to have served in the military back then), he was obviously not speaking from a personal encounter with der Führer, but probably based his claim on old newsreel footage. 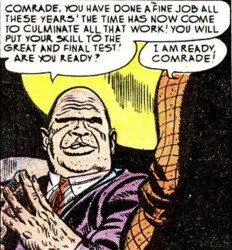 Blayne's spy leader visually reminds me of the Kingpin (Wilson Fisk (who was also first drawn by John Romita) @ Amazing Spider-Man I#50). An unidentified Communist leader, he maintained an office in the vicinity of New York City; he sent Chuck Blayne on a mission to plant two bombs in the United Nations Building.